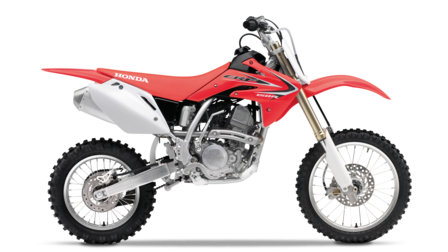 VPL Terms and Conditions: New CRF150R, Subject to model and colour availability. Representative Example based on 2 years 6.9% VPL. Offers applicable at participating dealers and are at the promoter's absolute discretion. Indemnities may be required in certain circumstances. Finance is only available to persons aged 18 or over, subject to status. All figures are correct at time of publication but may be subject to change. Credit provided by Honda Finance Europe Plc. Cain Road, Bracknell RG12 1HL. Honda Finance Europe Plc is authorised and regulated by the Financial Conduct Authority, Financial Services Register number 312541. Liquid-cooled 149cc 4-stroke engine for unrivalled performance and ease of use. New cylinder head with optimised combustion chamber shape and new camshaft for stronger power, torque and drivability across a wide rev range. New short-skirt forged slipper piston with revised crown shape for enhanced performance. Vertically split crankcase with new breather hole for increased efficiency. New FCR carburettor with directly actuated accelerator pump for more accurate throttle response and a light twistgrip action. New graphics inspired by the CRF250R and CRF450R. Revised suspension settings for the 37mm inverted Showa front fork and Pro-Link rear suspension system, delivering ideal bump absorption. Advanced NiCaSil cylinder lining ensures cooler running and prolonged engine life. Rigid and lightweight high-tensile steel frame provides effortless cornering and accurate straight-line tracking. Powerful and progressive hydraulic disc brakes front and rear.